Just a random snippet to um... kickstart your Monday. Bleughhhhhh. Anyway the other day I wore an old pair of Rubi shoes (the popular affordable ones selling at Ion) to school. They were at least 1 year old, but I had only worn them ONCE. I remember the exact day I first wore them. It was the first time I had lunch with Alaric at the canteen (shortly after *I* added him on Facebook ^^) (because I knew he'd add me on BBM, which he did) and I was wearing jeans that day (I never do). Every Wednesday that semester was Themed Clothing Day with my friends, and so that day the theme was jeans. And I remember feeling distinctly self-conscious and uncomfortable because I never wear jeans. So fast-forward 1 year and 4 months (that's how long we've been together); I decided to wear them out. First, the right sole came off. Kinda uncomfortable, but still possibly manageable. I was worried though because I had a long day that day, but I didn't have time to go home or to buy a new pair. 20 minutes later, the OTHER sole came off. Not only did it come off, the top and bottom completely detached. Impossible to wear. How long before I have to walk barefoot?! Luckily I could take Alaric's mom's slipper, which was kinda bling but still sort of matched my top that day hahaha. It wasn't in the best shape but hey, my Havaianas look grimy but they've lasted me 3 years (and counting, I'm still wearing them). Where got so suay one?! 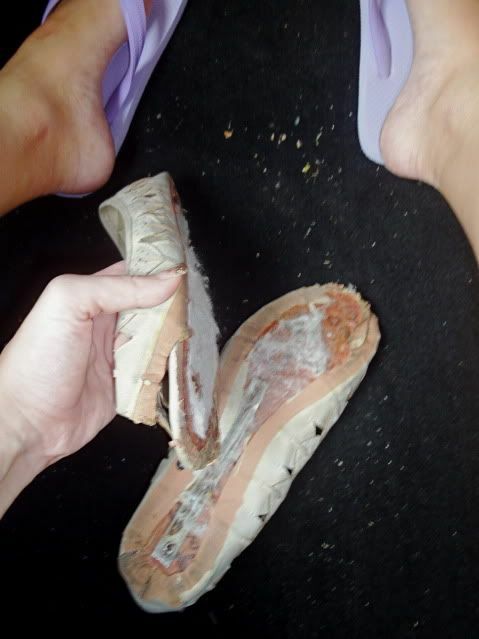 Half the right sole totally broke off! I guess it's better than the straps detaching, because I could still wear it. Just that my right foot was half stepping on the ground hahaha. Made it all the way down the lift when the right slipper completely gave way! I ditched both slippers outside the lift (got many curious stares) and hobbled the last few steps completely barefoot. HALLELUJAH! THE SLIPPER SELLER WAS THERE. So I bought the purple slippers you see above in all the photos, and it was only $5! They're very comfy too, just that I find the straps a bit too wide. But woohoo! A friend later messaged me to say he had just spotted the 0.5 of my right sole near the canteen hahaha. Actually the whole thing was quite funny to me, but I don't know what I would have done it there really was NO slipper seller that day. Ok no moral of the story. The end. HAHAHAHHAHAHA omg this is why i love you! You're way too candid about everything & unlike hundreds of other model bloggers out there, honest & unpretentious. epic day for u! totally~~! hahaha i was really suay today also, my calculator was not working when i was having my exam this morning. Haha, that's an funny entry, soapz. I once wore my brown pair of korean oxford out, after more than a year of keeping it in my shoerack. I had only worn it THRICE at most. Less than a minute of walking in them, 1 sole fell apart. I carried on walking though. Within 3 mins, both soles had 'disintergrated' and I had to change my walking course and head back home. That happened to me once too, when I was on my way to work, though it's a good thing I lived like 5 minutes away. Walked home and changed to a pair of heels instead. haha mine was worse. My slippers broke while i walked past the fastfood restaurant and everyone inside was staring at me. There were no shops selling slippers or any other forms of footwear nearby. I had to walk home barefoot(imagine stepping on the yucky dirty ground which may contain birdshit/spit etc)and attracted a hell lot of stares. Worst day of my life ever. 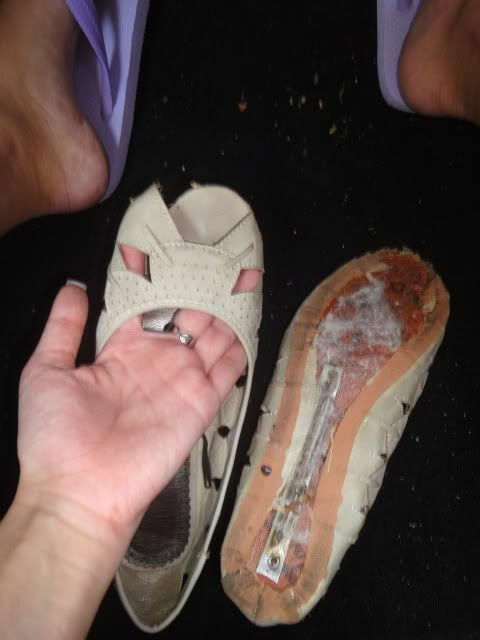 Moral : Dont wear a pair of shoes that you haven't wore in a long time, haha! I know it's mean but it'll be even funnier if the purple slipper broke TOO. Thank you for all the nice comments! (: The whole situation was funny lah; can't take credit for that haha. I mean not, one but TWO pairs of shoes breaking? Mega FML.